As an International School educator, I am often asked “When moving to a new country, how does one pick a good International School?” So when HiFX asked me to offer some advice for their Expat Tips page (see here) I thought I would elaborate on my advice a bit further. International Schools were traditionally set up for children of missionaries and business people who were frequently moving around the world for work. The International Baccalaureate (IB) program was then created as a framework for International schools to follow. Wherever a child ended up on the planet, they would be roughly learning the same things, if the school was an IB school. The IB Diploma is offered at most international schools; this Diploma is accepted by universities worldwide. Some schools also offer Advanced Placement (AP) or the Cambridge IGCSE. Choose a school that has been accredited. The Council of International Schools (CIS) or New England Association of Schools & Colleges (NEASC) are two of the most well-known accreditation organizations. An accredited school will have curriculum that is articulated and matched to specific standards. The accreditation process ensures that a school has a positive learning environment, a strategic plan for its future, that the school is mission driven, and that the school has high safety standards. Accreditation also allows students to transfer credits between schools. If the school is accredited by an American organization, this allows schools to offer diplomas that are valid for American university entry. Is the school a member of reputable educational organizations? In Europe, a good International school will be affiliated with the European Council of International Schools (ECIS). There are also councils of International schools within each country or region. In order to be a part of these councils, the school must comply with certain standards. For example, if a school in Germany is not a member of the Association of German International Schools (AGIS), you might want to ask why? What is the turnover of teachers and administrators? International Schools are, by design, places where the student population is transient. Teachers also choose an international setting so they can see the world, staying a few years here and a few years there. But if the school has a low turnover of teachers, you know the school treats employees well. Teachers might sacrifice their wanderlust when the school provides excellent pay and benefits, quality resources for the classroom, and plentiful professional development. A happy teacher means happy students. Be wary of schools who have a high turn over in Administration. If Administrators have been with a school for a while, it is because they are happy. They are invested in the school, its vision, and its programs. If the school is hiring a new Director and Principals every two years, then the school is always in flux, coping with the new visions brought in with each new leader. 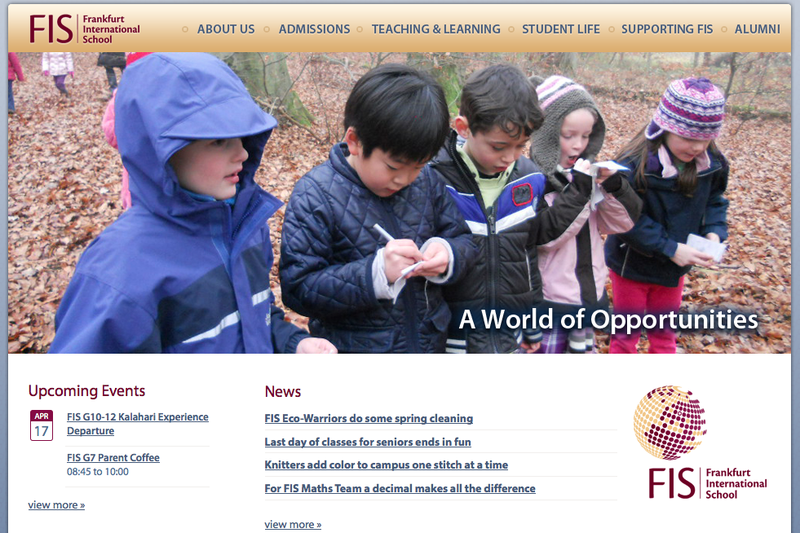 Does the school’s website make you want to visit it? A school website should be up to date. It should have a full calendar of events showing a variety of things: parent meetings, sporting events, activities, etc. The site should have student resources as well as parent resources available. Don’t be worried about areas that are password protected. This allows the school to create safe spaces to communicate only with its clientele. The curriculum map, programs, and the school’s Strategic Plan should be easily accessible. The website should express that the school values good communication with all its stakeholders. 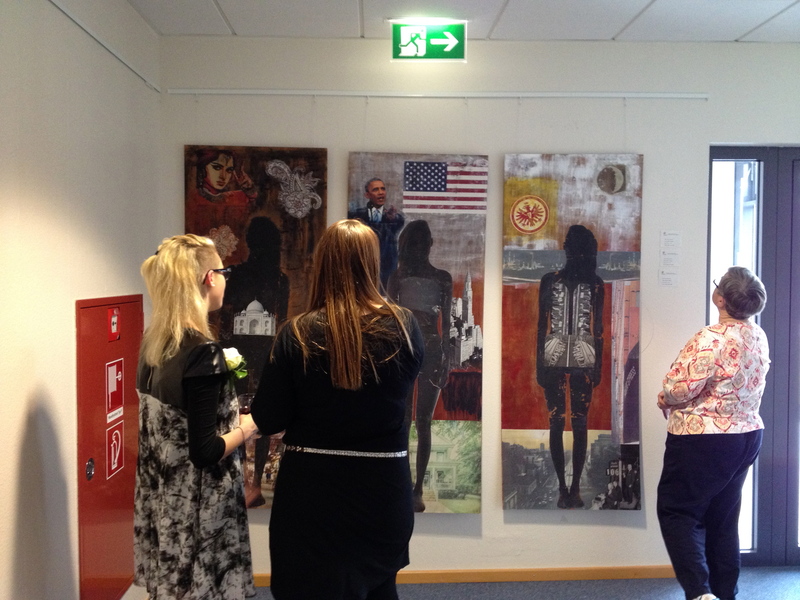 Are there pictures of students shown of various ethnicities? Are the students shown participating in a variety of activities? Does the calendar show the kinds of events that you and your child would like to be involved in? Can you easily access the information you are looking for? A school website should feature students and be easy to navigate. When you get the chance to visit the school, ask your tour guide to describe the school’s culture. They should be able to give you a description of the overall values of the school. Keep your eyes and ears open as you walk through the halls during passing times or breaks. Is it a highly academic school? Does the school have long practiced traditions? Does the school bring in the local culture as well as value the home cultures of its clientele? Do the students seem happy? Are they congregating in areas for conversation and study? Do you see teachers walking alongside students or sitting and having conversations with students in meeting areas? 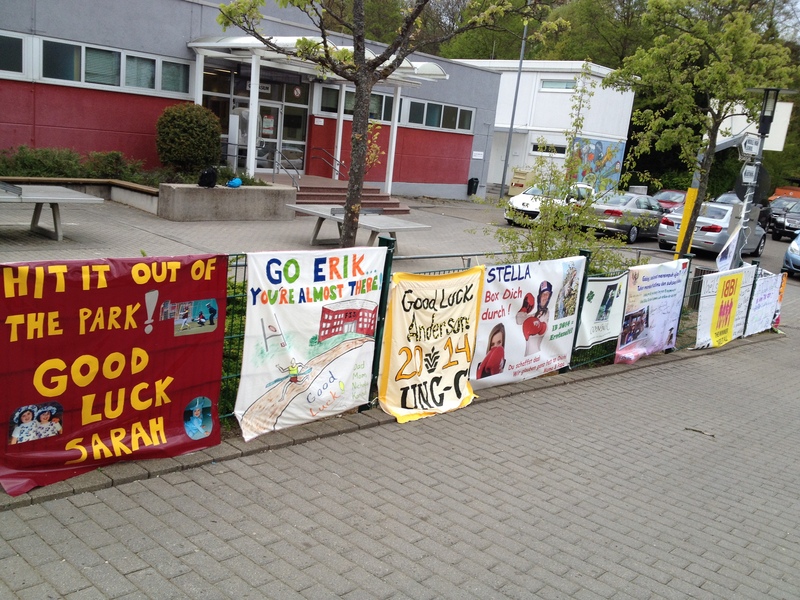 Banners placed around school by parents to encourage students to do well on their 12th Grade exams is a tradition at our school and at German Gymnasiums. Does the school value languages? Most International Schools are set up with English as the language of instruction. Students are also required to learn the language of the community. Even though most subjects are taught in English, you should hear other languages being spoken in the hallway. If only the local language of the community is being spoken in the hallways, then the school may not be internationally focused. A good international school should also provide native language instruction for students living away from their home country. Students need the opportunity to have access to language classes that will allow them to sustain their native tongue. Some schools offer these classes within the school day; others will offer them as after-school or weekend programs. Do students have access to technology? In this day and age, students and teachers should have access to 21st Century tools in the classroom. A good international school will value technology. You should see teachers using interactive whiteboards and projection systems in the classroom. You should see students using laptops and tablets in the classroom. Technology should not be confined to a lab. Is the school a 1 to 1 laptop or tablet school? Do students bring their own devices? What kind of access do students have to wifi throughout the school? Are limitations being placed on students when using devices at school? Does the school’s use of online tools allow for easy access to homework, information, and grades when not at school? Does the school’s strategic plan include visionary direction for technology training and use for the future? Students working at our Tech Deck. 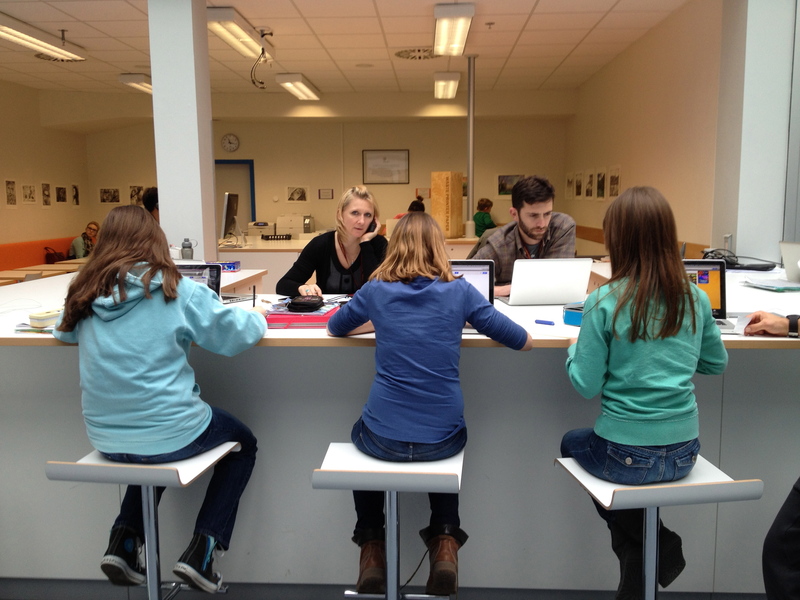 It is a central hub for students to collaborate and get support for their devices. Does the school have a library and is it equipped with a teacher librarian? A school library is more than just a place to store books. And a librarian’s job is not just to buy and check out books. In today’s world, librarians need to be educators. They need to be working in classrooms to help students with research skills. They need to help students and teachers find ways to curate information and resources. They should be there to guide students through the plethora of digital and print resources available to them. When you walk into the library do you see students there? Are they working? Are they reading? Are there places for students to meet and collaborate? If you go are in the library at lunchtime or break time, is it abuzz with activity or is it silent and empty? Does the school provide programs beyond the general curriculum that will enrich the life of your child? Schools should provide activities for students that go beyond academics. The arts are a vital part of education and enrichment for children. A good international school will provide opportunities for students to participate in Band, Orchestra, or Choir. A good international school will allow students to express themselves through Art, Drama, Dance, or Design and Technology. Larger schools are also affiliated with organizations that sponsor festivals and competitions for schools in the region. This allows students to compete against or join with students from other schools in a variety of ways. If sports are important to you, inquire about the athletic programs provided by the school. Most international schools have sports programs that compete with schools in their region. Do some research on the schools in your new city. There are a few websites that provide parents and teachers a place to review International Schools. Some charge a subscription fee and some are free. See International School Community, International Schools Review, and The Good Schools Guide. Find out if there is an online expat forum where you can ask questions about schools. Expat forums are full of all kinds of interesting tips. If you are moving to Germany see ToyTown. There are also Expat websites that provide resources on all kinds of topics having to do with relocation. Try websites and groups like Expatica, Expats Blog, or InterNations. What things do you look for when considering placing your child in a new school? While you are correct that high turnover is a warning sign, a school that has too many long term teachers and administrators can also be a problem. In this scenario schools risk becoming stale and “too comfortable” which is also a problem. Especially concerning is how many Admin members are long term employees who have risen in the ranks. While this on its own is not a problem, if too many of them are there is a risk of a school not benefitting from fresh ideas and perspectives. All in all I believe that a good school strikes a good balance between long term employees and those that move on after a couple of years in order to seek new experiences that an international teacher can gain by moving around from country to country. I think Expatchild.com has some articles on helping families relocate, some of her stuff looks at picking schools, but it is still from the perspective of parent (outsider). Seeing a few schools as a teacher (insider), gives a unique viewpoint. What would I want for my own child? You are right about the balance between leavers and stayers. But it has to be the right balance. We have a teacher retiring after 30 years here. He is still looking at new ways to connect kids with writing and he has only 6 weeks left. He is a great role model for both kids and teachers. Your points on Admin are also true. It is all about balance and innovation. Thoughtful and practical advice. I’d agree with Frank about leavers and stayers…in fact, I know of an international school where the superintendent has been there 13 years, and he should have left a decade ago. All of your tips are spot on. In our case, we also considered how much travel our kids would get to do as members of teams, music groups, class trips, and clubs. These international trips really helped our children to grow in many ways. Trips are a highlight of the year, for teachers too! This was something I realized I left out of the other programs section. Nice piece but I do think this is written from the perspective of a writer who is in a large, established international school in a stable country. In some settings, the teacher turnover is not a reflection of the school – of teachers being ‘taken care of’ but because of local work permit or tax laws that make it difficult for teachers to stay longer, or even environmental conditions that make it difficult to stay long term. Another area I’d comment on is about the website – yes they are a’window’ to the school, but some smaller schools just don’t have the budget to maintain and update with frequency, in which case their websites just don’t have all the bells and whistles….it is not necessarily a reflection of the quality of the school. There are many international schools that are small, start-ups or trying to keep costs down, and just don’t see investing in a souped-up website as the priority. It is also sometimes a reflection of how much local competition a school has…if it has local competition there is more incentive to market more heavily on the website. Lastly,,,membership in professional membership organisations is an indicator, but as former Deputy Executive Director of ECIS, I would say that the real question is how much the school interacts with and uses the services or attend the events of that particular professional organisation. I know there were and still are plenty of ECIS member schools that just want the logo to hang on the wall and print on the letterhead…they may have never been involved, or at best it is only the head who has attended conferences while teachers stay behind. And I agree with others that long-serving staff is not always an advantage. The presence of a robust performance management scheme with professional development expectations is particularly important when there are longer-serving staff who are sometimes reluctant to ‘refresh’ their expertise. I’d like to suggest that one interesting resource for scoping out an international school is the Good Schools Guide International website. Schools cannot pay to go into the GSGI, it is based on research using a lot of parental feedback and so sometimes offers a refreshing perspective from the ‘customers’. I agree with all that you are saying here. But then again, if the country is not so stable, parents will probably not have choices between schools. You are so right about long serving staff and that the key is continued prof. dev. I’m lucky to live in a place where those retiring this year, are still working to try new things to connect to their students. I will link the Good Schools Guide to the article. This is not a resource I was aware of.